SilverFast History - a feature that will write history. All processing steps in your image optimization workflow are memorized and can be recalled later. But SilverFast History is much more than just a simple "undo" functionality. You can scroll forwards and backwards through your editing, you can disable and re-enable every single tool. How is the SilverFast History working? The top-most entry of the vertical toolbar is the "History" button. It opens the History toolbar directly above the preview window. A single entry "Original" shows your preview scan, or the recently opened image file as a starting point for your image optimization. For each image adjustment that you make, for each SilverFast tool that you use, a new entry including thumbnail preview and tool label is created. You can scroll back in the history of your optimization at any time to exactly assess previous steps in the preview window. 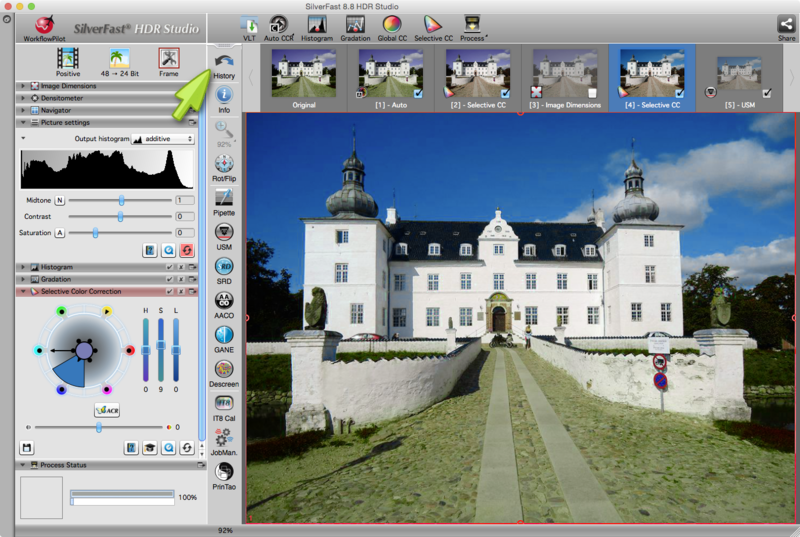 Therefore, also using the History toolbar, individual tool effects can be switched off and on again. Are you better satisfied with an earlier state of your optimization, simply reopen it, and work from there on until you reach your perfect final result.